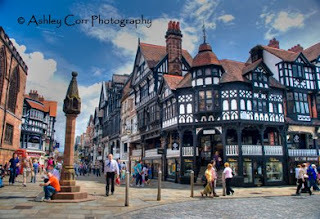 A couple of weeks ago I visited Liverpool and Chester for the first time. I liked both places a lot and intend to revisit in the near future. Liverpool was a bit of a washout so I never bothered taking any photographs, but Chester presented an opportunity with much better weather on the day. 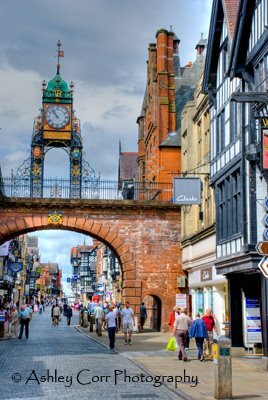 What a lovely city Chester is. Very photogenic. I wish I could have stayed longer and explored the place in more detail, but never mind. I'd recommend this as a place to visit as there's something for everyone. York is quite similar in style, although the Tudor style buildings in Chester make it a unique city in tradition. These 3 photo's were taken on my Fuji compact camera as I strolled through the place on a fairly busy day. If you intend to park your car in the city centre then be prepared for the steep charges. Ten quid for just over 3 hours, ouch, give me the good old north-east anytime. I checked out the Cathedral and riverside before I left Chester and it will definitely be a place I'll return to, probably with my DSLR with ye olde camera batteries fully charged. My Photograph On Tyne-Tees Television! A couple of days ago I done the school run to pick up my son Christopher who is 8 years old. Whilst waiting for the school door to fly open before the stampede I was engaged in conversation with a couple of friends who were waiting to collect their grandson. They were complimenting me on my photographs that had been published in the Sunderland Echo newspaper on a few recent occasions. It's always nice to get feedback like that and equally as nice to know that my work has been spotted by people I know personally. Anyway, I was encouraged to send some photographs into the BBC and ITV regional news programmes, which was something I'd previously considered but never actually got round to. Aye, well, time to get me finger out and do the necessary. BBC and ITV regional news programmes both run a similar slot by showing viewers photographs of a weather theme at the tail end of their bulletins. I selected a nice image that I shot a few weeks ago at the nearby Rainton Meadows Nature Reserve in Houghton-Le-Spring. I remember it as if it were yesterday. It was a lovely warm summer night so me and the little fella popped over to the meadows for some quality time together, hoping we'd catch a few tadpoles at the same time. I took my camera along as Christopher tipped me off the day before, telling me he'd seen a pair of Mute Swans on one of the ponds with it's brood of 8 cygnets. I've photographed these big birds on quite a few occasions and the key to close up Swan photography is...wait for it...a loaf o' breed!!! Yes, dangle the carrot in the form of a Warburton's thick toasty loaf and you're onto a winner...oh yes. A tried, tested and very reliable method of bringing the birds in close - just what you need when you're operating with a modest 18-135mm lens. We arrived at the waters edge and they they were, at the far side of the pond. One rattle of the bread bag and across they came. A lovely sight - 8 chicks, probably 1-2 days old, flanked by their parents. We both through the bread into the water and although there was some aggressive hissing at first from both parents, they quickly got used to our company and polished off the full loaf within a few minutes. During this time I fired off a dozen or so frames of the swans, just as the sun had set behind them. We then headed back to the car and made the short journey home. I was very pleased with the batch of photographs. One in particular caught my eye and this was the one I submitted to Tyne-Tees Television on the ITV1 channel. I emailed them the image on Thursday morning (16th) and it was shown just a few hours later on the same day!! Here's the best bit - I missed the programme....arrrghhhhhhh!!! I only found out about it when I received a few text messages from friends who had been watching ITV when my photograph was shown. Typical eh. Oh well, never mind. I'm still chuffed about the whole thing. I think I'll have some more of this. Time to submit some more images to those nice people on the telly. Maybe next time, if there is one, I'll be in front of the telly when my photograph is shown. (Hangs head in shame...tut tut). Hello everyone and welcome to my blog. It is here where you can catch up on my latest photography exploits as I wander aimlessly around the North-East of England and occasionally further afield. 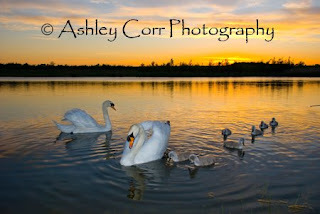 If you've stumbled across my blog and haven't seen any of my work, then why not pop over to Ashley Corr Photography and get acquainted. Meanwhile - I'm gonna tart this page up now as it's looking rather blank. Time to fill me boots.